A multitalented SUV with model good looks. Looks aren’t everything, but there’s no discounting that they matter, particularly in a place like tony Aspen, Colorado. This is the land where Hunter S. Thompson entertained Hollywood bigwigs and eventually shot himself, the place where women carry multiple Louis Vuitton handbags and brag to strangers about getting new ones every Christmas, and a place where the local dispensary in town is lit up like a new saloon. As I hustle past the rough peaks and still-snowcapped mountains around Independence Pass, headed toward the multimillion-dollar chalets, it’s clear that the 2017 Jaguar F-Pace has those looks in spades. Though beauty may only be skin deep, the new F-Pace is a whole lot more than just a pretty face. This is the British brand’s first foray into the SUV game and it comes nearly ten years after the first luxury crossovers made their appearance on the market. Jaguar is hoping to play up the svelte-looking crossover’s loose relationship to its popular F-Type. While the F-Pace takes the “F” in its name from the sports car, there are few mechanical relations between the two. The company hopes that the F-Pace will be what gets young, affluent buyers through dealership doors. While the F-Type got people excited about the brand, sales haven’t been as robust as Jaguar hoped – it sold just 4,600 F-Types in the U.S. in 2015. While numbers for the beginning of this year have been on the uptick (there was an eight-percent year-over-year increase last April), Jaguar is hoping that the F-Pace helps the company reach its goals of quick growth. 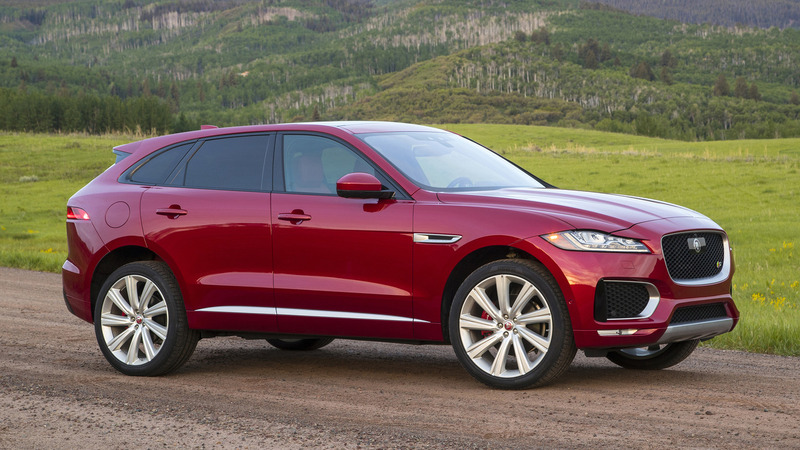 The new SUV just went on sale last month and if the first flush is any indicator, Jag has a winner on its hands. According to the company, it sold 666 units in the first month, making it the fastest selling Jaguar yet. Jaguar sold 666 F-Paces in its first month on sale, making it the brand's fastest-selling vehicle yet. The F-Pace is offered with three engine variants. The entry-level gasoline variant, the F-Pace 35t, gets a supercharged 3.0L V6 engine and makes 340 horsepower and 332 pound-feet of torque; Jag says it does 0-60 in 5.4 seconds. Step up a level to the F-Pace S – the sweet spot of the lineup – and you get the same engine tuned to make 380 hp and 332 lb-ft, hustling to 60 in 5.1 seconds. Jag will also offer a diesel version towards the end of the year, the 20d, powered by a 2.0-liter turbodiesel four-cylinder engine with 180 hp and 317 lb-ft. The aluminum-intensive diesel engine was developed completely in-house for Jaguar and brings the F-Pace to 60 in an estimated 8.2 seconds. There’s no reason to worry about Dieselgate either, as Jaguar has already announced that the engine is CARB- and EPA-compliant. Each engine variant gets a ZF eight-speed automatic transmission. While all F-Pace models get all-wheel drive, the crossover spends 90 percent of its time with a rear-wheel-drive bias, and that fact alone makes it a joy to drive. 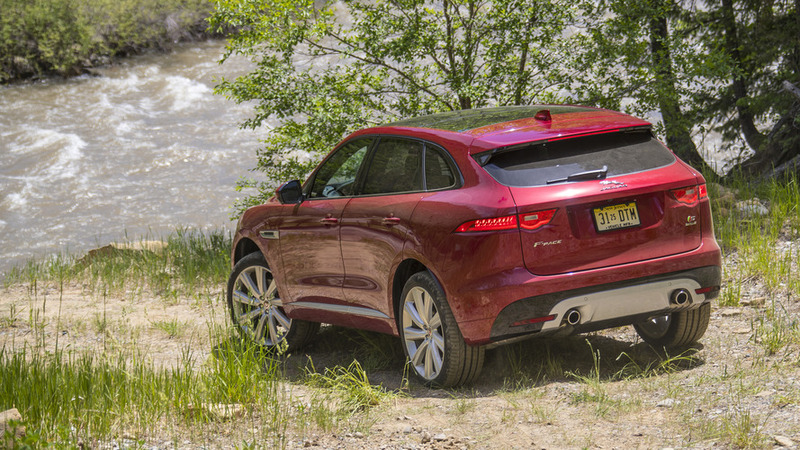 I spent some time behind the wheel of the 35t R-Sport and the top-of-the-line F-Pace S (pictured here) on the incredibly winding roads around Aspen and Gunnison. While all F-Pace models get all-wheel drive, the crossover spends 90 percent of its time with a rear-wheel-drive bias. Even with the entry-level engine, the 35t, the F-Pace feels eager to run and is a blast to drive. In Dynamic mode the exhaust note opens up and that characteristic raucous engine sound bounces off the steep granite walls around me. The F-Pace’s adaptive dynamics system reads the road surface up to 500 times per second and adjusts the ride based on what it sees. The system also allows you to toggle through pre-set drivetrain, transmission, and suspension settings on the panel in the center console or choose your own setting combination using the optional 10-inch touchscreen in the dash. I eventually settled on Dynamic steering and drivetrain, and Comfort suspension for the long and winding route. The front aluminum double-wishbone suspension sends ample feedback to the driver while the rear integral-link suspension cushions the ride and roll, giving the F-Pace fantastic body control over roads that had seen a winter of freeze and thaw conditions. Steering is direct, if a touch light. The only reservation I did have about the F-Pace is that the brakes, in both the 35t and the S level, are a little softer than I’d prefer. 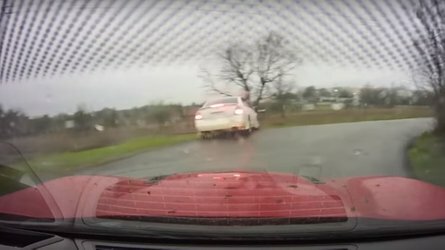 That said, this is something that drivers will inevitably get used to but should be aware of when getting behind the wheel for the first time. 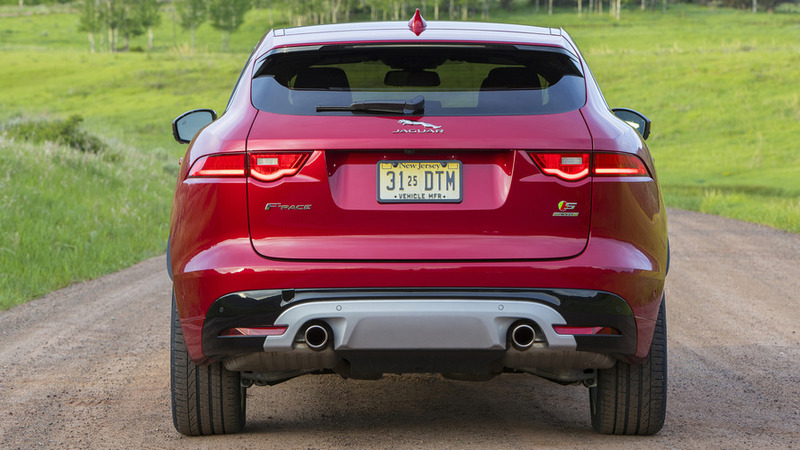 The F-Pace feels eager to run and is a blast to drive. If a rear-wheel-drive crossover sounds like something from the brain of the insane, it’s not. 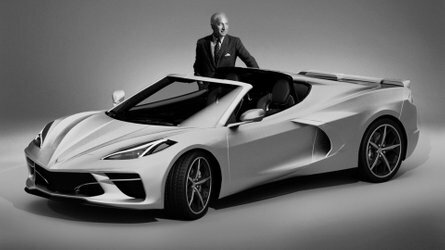 That mentality informs the design and the crossover is all Ian Callum, the man behind striking beauties from Aston Martin and Jaguar. The F-Pace’s styling and shape is closely linked to the original lines of the concept C-X17 launched at the Frankfurt Motor Show in 2013 and it’s equally as jaw-dropping in person. The crossover has muscular haunches that can be glimpsed in the side mirrors, and a long hood that extends out in front. 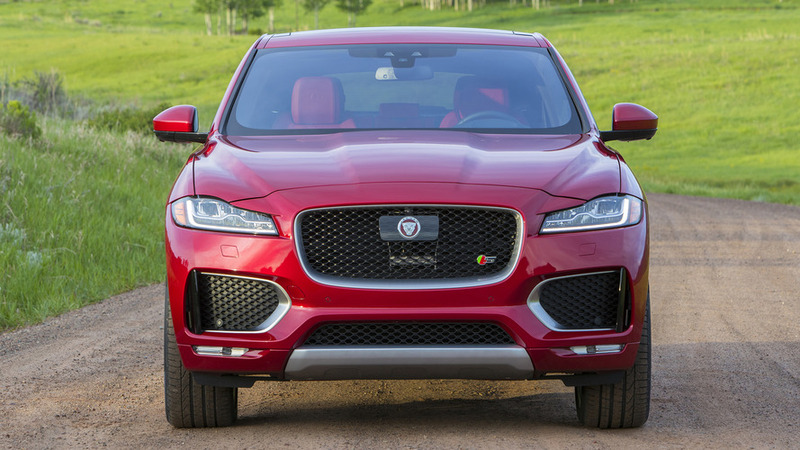 The aggressive grille is balanced with Jaguar’s cat-like LED headlights that give the crossover an assertive look without being overly stylized. What looks good outside, however, doesn’t always work perfectly inside. One pinch point is the ingress and egress in the front. Even when the seat is pushed relatively far back, both passengers and drivers have to deeply duck-dive to get under the raked A-pillar lest they conk their heads. Back seats, however, are surprisingly usable for two normal-sized adults – comfortable, too. Add another body in the back (this is a five-passenger vehicle, after all) and there might be some space issues – but overall it’s pretty roomy for a midsize crossover. The standard panoramic sunroof helps with that spacious feeling, too. And with a cargo volume of 33.5 cubic feet (with the second row of seats up), there’s more than enough room for bags and gear. When compared to offerings from Audi, BMW, and Porsche, the dash and interior materials are on par. Jaguar likes to compare the F-Pace to Audi’s Q5, BMW’s X3 and X4, and the Porsche Macan S. Strangely missing from the company’s comparison however, is anything in the Mercedes lineup, like the similarly priced GLC. When compared to offerings from Audi, BMW, and Porsche, the dash and interior materials are on par. 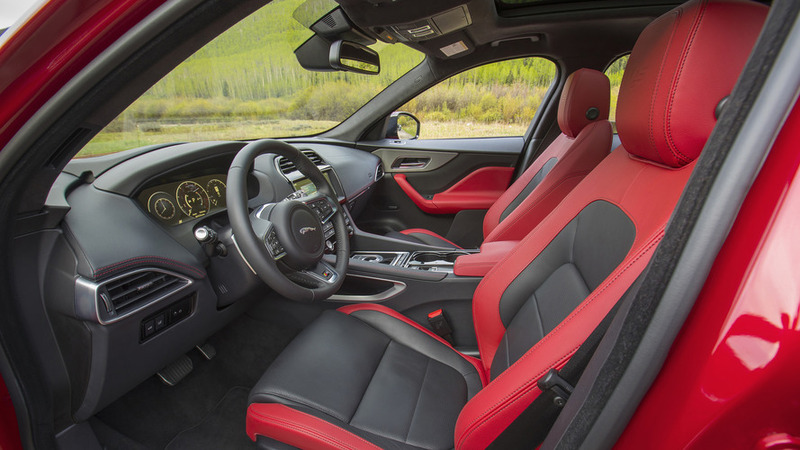 There are some plastic bits and some fake leather throughout, even on the top-level F-Pace S. When put up against the interior of the GLC however, the Jaguar F-Pace falls flat. 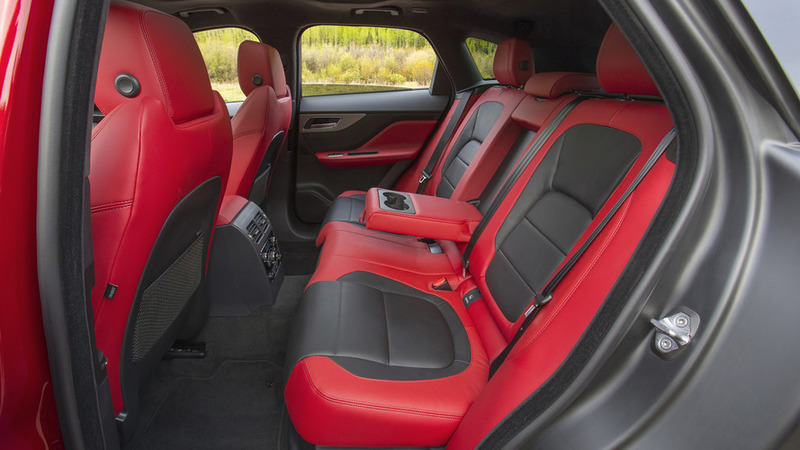 Sure, the leather is supple, the optional 14-way adjustable seats are supportive and comfortable, but Mercedes’ upmarket offerings like optional open-pore wood dashes and specialized seat stitching gives it a real luxury edge over Jag. One place that the Jaguar F-Pace does outshine its competitors however, is in its optional Technology package. The F-Pace S that I drove came equipped with it and the fully digital binnacle, included in the package, is one of the best executions of a digital dash in the business. It’s highly customizable, allowing the driver to use the entire screen for things like the navigation, or split the screen with infotainment information like music, news, or weather, with standard features like speed. The screen settings are controlled by a set of buttons on the left side of the steering wheel, and menus are simple enough to figure out in just a few minutes. Unlike Audi, which also offers a fully digital dashboard that pushes the speedo and tach to the edges of the screen to accommodate a small map in the middle, the map in the Jaguar F-Pace can take up the entire screen with a small speedometer reading in the lower left corner. This makes reading and seeing the navigation screen much easier and more convenient for the driver. Though it’s expensive, the tech package is something you'll use and appreciate every single day. There’s also gets a 10-inch touchscreen in the center stack with the Technology package that is buttonless and elegantly executed. It has an upgraded quad core processor that makes the system responsive and fast. You scroll and zoom the same way you would on your smartphone, and can customize the home screen. The center stack that comes in the base model, conversely, is far smaller, less responsive, and clunkier. Buttons line the sides of the system and feel cheap and flimsy. 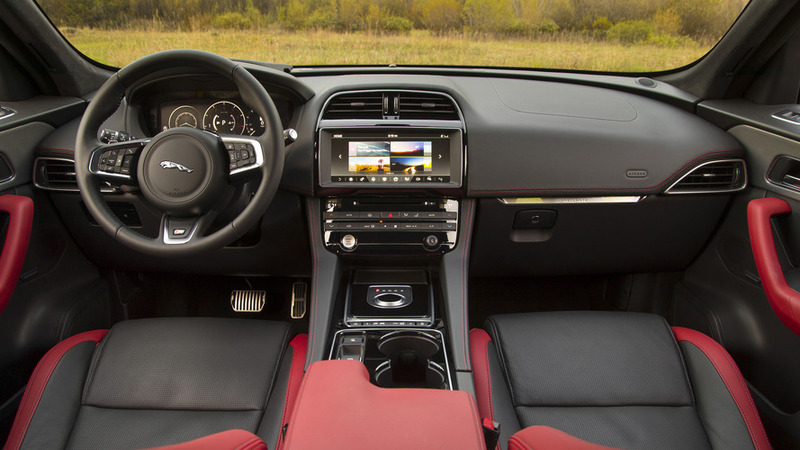 Compared to the infotainment system offered in a base model Mercedes-Benz GLC, the setup in the Jag is like something ripped straight out of the 1990s and bolted on. Though it’s expensive, the tech package is something you'll use and appreciate every single day. One neat feature worth mentioning is the Activity Key (a $400 option) that allows you to lock your actual keys in the car and head out wearing what looks a lot like a FitBit on your wrist. When you return, you can unlock the F-Pace by touching the band to the J on the back tailgate. The system works surprisingly well and uses RFID technology – much like the NFC chips you find in your credit cards – to lock and unlock the car. The band is waterproof up to 66 feet and works well enough that I’d use anytime I was heading out for a hike, bike, or swim. 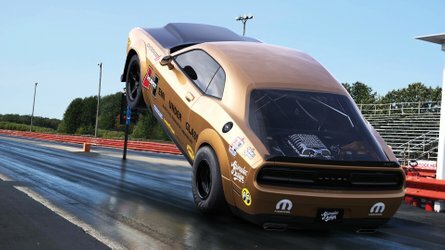 Nearly $41,000 for the base model makes it competitive in the market and Jag’s impressive Technology Package makes it stand out in the pack. Speaking of, while most owners won’t dream of dusting up their F-Pace, I got a chance to take it out on a short soft-roading path located on a $3-million property that is currently owned by the Koch family. Yes, that Koch family. 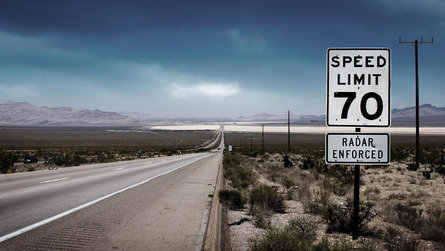 Jaguar’s All Surface Progress Control (ASPC) allows the driver to set a low speed to climb or descend. 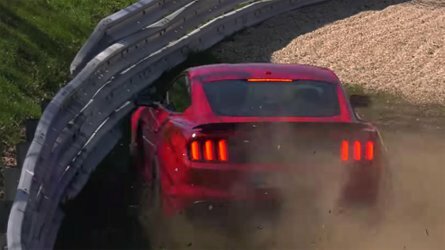 On the rocky and rather steep slope up to a grassy overlook the system performed very well, holding the crossover steadily at four to five miles per hour without jostling occupants. When I tried to modulate the speed myself I found that, because of the undulations, I wasn’t able to be as smooth or steady as the system. Toward the end of the day I took a path up Snowmass that went from asphalt to rough dirt road and the F-Pace handled it like a champ, keeping passengers and bags comfortable and cushioned from what could have been a very rough ride. 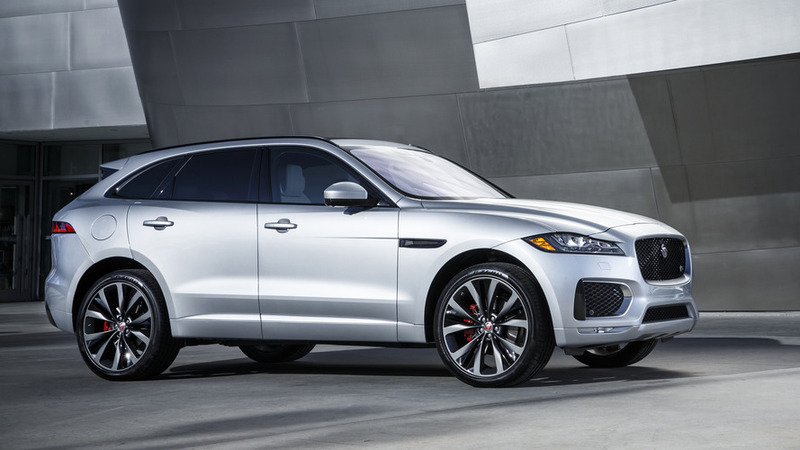 Jaguar will offer the F-Pace in five trim levels, starting at $40,990, less delivery of $995. Up from the base model are Premium, Prestige, and R-Sport trims, with the F-Pace S, sitting at the top, at $56,700. Options like the $1,800 Comfort and Convenience, the $3,200 Technology pack, and the $3,200 Driver Assistance package will add to the cost quickly. You can easily get the F-Pace north of $75,000 when it’s fully loaded. 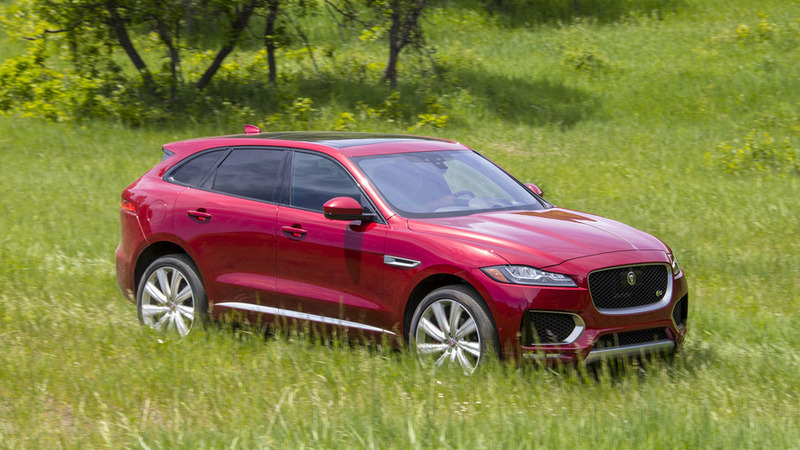 On exterior looks and price alone the Jaguar certainly beats out competitors like the Audi Q5, BMW X3 and X4, and the Porsche Macan S, but it falls down on fit-and-finish inside when put up against Mercedes-Benz’s GLC. Nearly $41,000 for the base model makes it competitive in the market and Jag’s impressive Technology Package makes it stand out in the pack. Looks aren’t everything, but they count for a lot, and on the surface, the 2017 Jaguar F-Pace has them in spades.